apply ethical frameworks to strategic marketing situations. 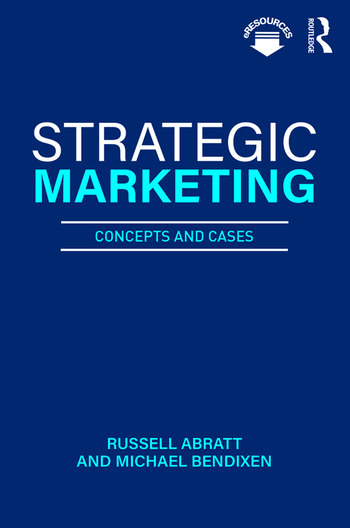 Strategic Marketing: Concepts and Cases is ideal for advanced undergraduate and postgraduate students, as well as those studying for an MBA or executive courses in strategic marketing or marketing management. Russell Abratt is a Professor of Marketing in the Huizenga College of Business at Nova Southeastern University. His research has been published in the Journal of Advertising Research, California Management Review, Industrial Marketing Management, Journal of Business Ethics, and European Journal of Marketing, among others. Michael Bendixen is a Professor of Marketing in the Huizenga College of Business at Nova Southeastern University. His research has been published in the Journal of International Business Studies, Journal of Business Ethics, Industrial Marketing Management, Journal of Business Research, and European Journal of Marketing, among others.